Exiting the "Forgiving Highway" for the "Self Explaining Road"
On America's "Forgiving Highways" it may be too easy to forget oneself. The first in a series of groundbreaking reflections from the travels of a 34-year veteran of New Jersey Department of Transportation. Gary Toth, who had previously never been to Europe, spent a week touring the Netherlands with fellow PPSers Fred Kent and Kathy Madden. Their mission was to learn more about the Dutch approach to Sustainable Safety, bikeped accommodations and community-based transportation. 30 years ago, the Netherlands, a country about twice in size and in population as New Jersey, was despondent over the high fatality rate on its roads. In the 1970s, 3,200 Dutch died each year in crashes, about ¼ of them pedestrians. This rate was about 15% higher than it was in the US at the same time. Around the same time, like most countries around the world, the US also decided to do something about highway safety. Both the US and the Netherlands endorsed improved technology in cars, driver education and the 1960s “Forgiving Highway." The major difference rests in how engineers approached safety in built up areas -- cities, villages and suburbs. More on this in a moment. Forgiving Highways is a concept that designs roads to "forgive" mistakes made on the road. It seeks to smoothly redirect the vehicles that leave roads, and allow wide enough clear zones to bring vehicles to controlled stops if and when they leave the roads. Breakaway supports, burying the end of guardrail, clearing the roadside of unneeded obstacles, and flattening and rounding slopes and ditch sections became standard design as part of the concept. The idea that Forgiving Highways (wider and straighter) would reduce crashes on non-freeways took root during the 1966 National Highway Safety hearings. Leading the way was a nationally revered expert on safety: Kenneth Stonex, who during his career at General Motors, oversaw much of the research that created the basis for the Interstate Highway safety standards. Justifiably marveling in the remarkable safety record of the Interstates, Stonex and others sought to apply the Interstate principles to the rest of our roads. “What we must do is to operate the 90% or more of our surface streets just as we do our freeways… [converting] the surface highway and street network to freeway road and roadside conditions," Stonex testified. It sounded logical at the time... and a great political solution, because the responsibility for fixing the problem once again fell on government, not the individual. We dove deep into the Forgiving Highway philosophy and still have not come up for air. The Dutch also believed in technology and Forgiving Highways. However, they began to notice that while this worked on the high speed freeways and the low speed residential areas, they still had a problem in their "built up" areas. Recognizing that it is in these areas that they have the biggest conflicts between the purpose of roads for moving people and the value of roads in providing for exchange and access, they began to commit themselves to a different approach. They began designing roads in built up areas that induced motorists to operate their vehicles in ways and at speeds that were appropriate for passage through urbanized areas. The Dutch came to understand that the post-World War II world wide approach to making roads wider, straighter and faster simply doesn’t work on local and commercial roads in urbanized areas. Even today, groups with credible sounding names such as the Transportation Construction Coalition continue to advocate for bigger roads. This philosophy makes sense for the coalition, since its membership is made up almost entirely of contractors' associations. But does it make sense for the rest of America? Apparently not, according to research conducted by Eric Dumbaugh of the Texas Transportation Institute at Texas A&M. Wider shoulders and larger fixed object offsets – i.e. forgiving roadway design – has a statistically insignificant effect on roadside crashes. Yet widening shoulders actually increases midblock crashes. Why? The premise is higher speeds negate the effect of moving fixed objects further out, and cause more car to car crashes. 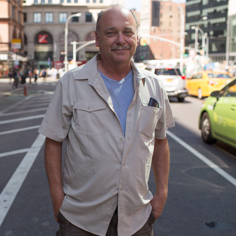 Dumbaugh’s research further shows that a Livable Street concept -- bringing life back to the street via trees, streetscaping, building setbacks, etc – leads to 40% fewer midblock crashes and 67% fewer roadside crashes than roadway averages (click here for more information). More importantly, injuries and fatalities from crashes almost disappear. Some American engineers are starting to accept this, but widespread adoption of this philosophy is still distant. 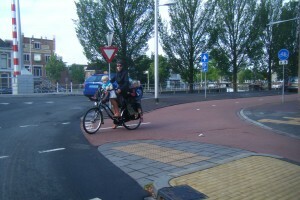 The Dutch have accommodated bicycling so well that a woman feels comfortable toting her three children to school. Back to the Dutch. There are three significant differences between their approach to safety and ours. 1. They rejected that wider, straighter and faster is better for non-freeways in urban areas. 2. They adopted a multi-modal approach to safety. Travel by bicycle or on foot is valued equally and bikeped accommodations are universal. 3. They are managing access to their “arterials” to a degree that many American access engineers would envy. The helps eliminate conflicts between mobility and local access, which destroys the capacity of our through roads and leads to substantial deterioration of safety. Cumulatively these three differences represent a disciplined approach to standardizing street design that the Dutch call "self explaining streets." Any American traffic engineer would instantly agree that one of the biggest sources of crashes in the US is lack of driver expectancy and confusion from road to road, sometimes within a segment of road. In fact, there have been some efforts in the US to foster self explaining streets, such as the Proactive Roadway Design philosophy described in the Pennsylvania DOT/ New Jersey DOT Smart Transportation Guide. Cities and metropolitan areas such as Charlotte, San Franciso, Denver, Savannah and Portland have all moved to create transportation policies that move away from wider, straighter and faster. But none have consistently or comprehensively taken root across the American transportation industry. The American emphasis on safety has led to a reduction in annual fatalities from 44,000 a year in 1975 to 37,000 a year in 2008. This is an accomplishment to be proud of under any circumstance but particularly impressive in light of our population growth over that period. This is a tribute to the engineering and planning profession in our country. During the same period, the Dutch have reduced their fatalities from 3200 to 800. If we calculate out the rate per 1000 people, the Dutch fatality rate is 40% of the American rate. This is remarkable, particularly when one considers that in 1975, their fatality rate was 20% higher than the US rate! If we in American had achieved a similar reduction in fatality rates, our annual fatalities would drop to just under 15,000 a year – 22,000 less deaths than we currently experience. To foster the infusion of the applicable Dutch transportation ideas into the US, PPS is forging a partnership with the Dutch National Information and Technology Platform for infrastructure, traffic, transport and public space – C.R.O.W. Stay tuned for more information on this exciting partnership in an upcoming PPS newsletter. Not a subscriber? Click here to sign up for free.